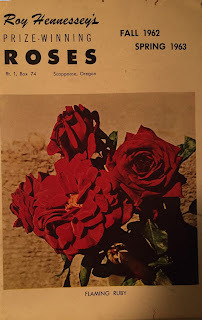 I was quite pleased to recently purchase a copy of Roy Hennessey's 1961-62 Rose Catalog after reading about it a few days ago in a book of letters between the writers Eudora Welty and William Maxwell. After I got it, I read bits and pieces of it. Welty and Maxwell were right about Hennessey's writing. He does not hold back his opinions and he is not one bit shy about writing exactly what he thinks the buyer should do, and then some. After reading his catalog, I'm pretty sure I would be a afraid to send him an order. Based on some of his writings, he might look at my address and decide my climate wasn't right for his roses. Or he might decide I was someone who might commit what he considered a cardinal sin, presumably punishable by being stricken from his customer list. That cardinal sin? Pruning the roots of the roses before planting them. According to Hennessey, we are not to do that. It's in bold type, multiple times in the catalog. CUT NO ROOTS! LEAVE ALL ROOTS ON! The other thing a customer dare not do? Order one of a rose variety meant to be planted for mass effect. He might sell you three such roses but would prefer to sell you six. 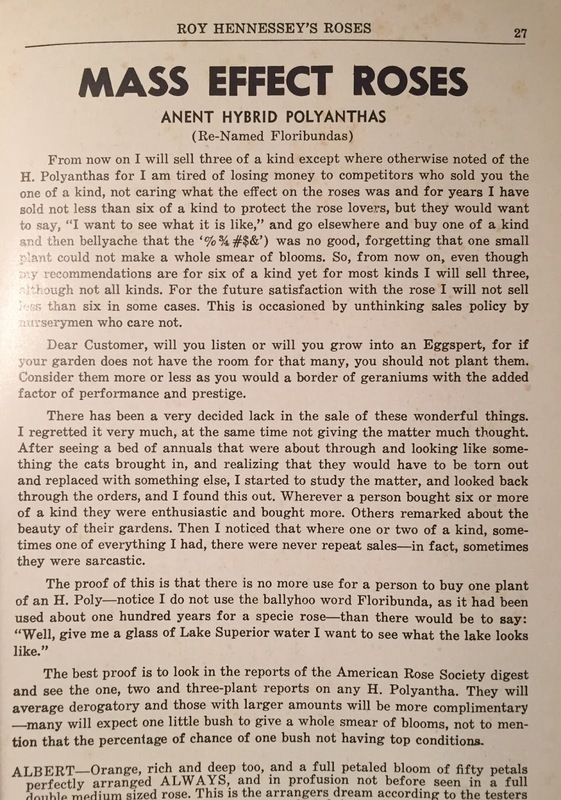 He said, in regards to buying one such rose, "Well give me a glass of Lake Superior water I want to see what the lake looks like." I've included a picture of the full page so you can read for yourself. By the way, he only sold his roses by mail. He considered those who came to the nursery to be "gate crashers" and wrote he didn't think it was fair to sell to them ahead of those from whom he accepted money several months before. Can you imagine today sending money "several months before" and then waiting for your shipment? And finally right there on pages 47 and 48, in very small print, Hennessey writes his political views, especially regarding his desire to get rid of the 16th amendment and reduce the salaries of public officials. He also wrote about how everyone needs to vote because not voting is a default vote. Whew. Scathing. 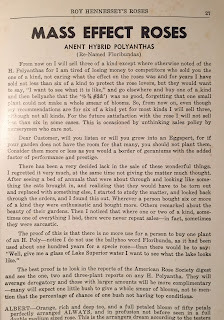 I cannot imagine such writing in a nursery or seed catalog today. Katharine S. White was right, too. After reading Hennessey, you need to read something else to soothe yourself. 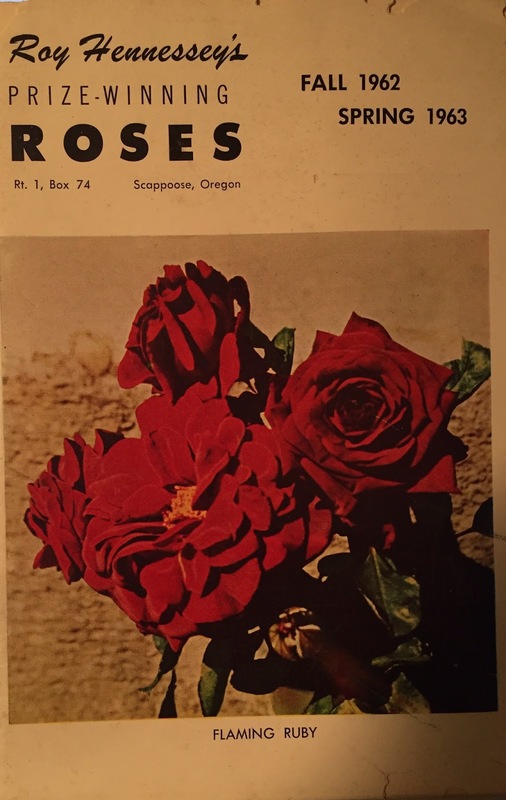 Her choice was a catalog called Bulbs for Pots written by Cecil Houdyshel. Oh how I need to read some Houdyshel writing now! And I will soon get some Houdyshel writing. Otherwise, I would not have attempted Hennessey. I should have some Houdyshel writing by Tuesday. And I'll start reading it right away. In the meantime, what shall I read to soothe myself? He reminds me of the Nazi Soup Man on Seinfeld. Ha.. Interesting even if not soothing. Maybe you should read a few benign garden blogs to settle your nerves. The quieting of November should help. Peace. Yuck. He sounds like a bully! I'm not exactly a fantastic gardener, but I know that when I have questions or need help, my neighbor always knows the answer. Her patience is something I want when I need help, and I supply it in return when she has a computer question. :) Great post. I think ' little bulbs' by Elizabeth Lawrence would be a good antidote. Eccentric characters are fun, but no one needs a bully - in the garden or out. My suggestion for a calming book is My Summer in a Garden by Charles Dudley Warner. He understood the trials of a gardener. Beverly Nichols would be a soothing antidote to the waspish Hennessey!